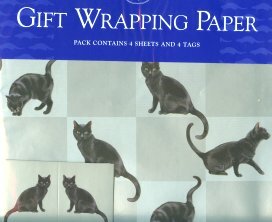 Here are four sheets of heavy weight cat gift wrapping paper that features beautiful black cats. Each sheet is 27.5" x 20". Matching gift card is 3.75" x 2". There are four sheet of wrapping paper and 4 matching gift tags in each package.